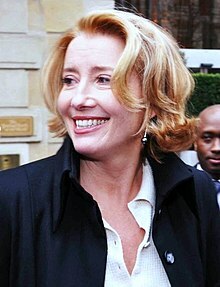 Emma Thompson (born 15 April 1959) is a British actress. Four a.m., having just returned from an evening at the Golden Spheres, which despite the inconveniences of heat, noise and overcrowding was not without its pleasures. Thankfully, there were no dogs and no children. The gowns were middling. There was a good deal of shouting and behavior verging on the profligate, however, people were very free with their compliments and I made several new acquaintances. There was Lindsay Doran of Mirage, wherever that might be, who is largely responsible for my presence here, an enchanting companion about whom too much good cannot be said. Mr. Ang Lee, of foreign extraction, who most unexpectedly appeared to understand me better than I understand myself. Mr. James Shamis, a most copiously erudite person and Miss Kate Winslet, beautiful in both countenance and spirit. Mr. Pat Doyle, a composer and a Scot, who displayed the kind of wild behaviour one has learned to expect from that race. Mr. Mark Kenton, an energetic person with a ready smile who, as I understand it, owes me a great deal of money. [Breaks character, smiles.] TRUE!! [Back in character.] Miss Lisa Henson of Columbia, a lovely girl and Mr. Garrett Wiggin, a lovely boy. I attempted to converse with Mr. Sydney Pollack, but his charms and wisdom are so generally pleasing, that it proved impossible to get within ten feet of him. The room was full of interesting activity until 11 p.m. when it emptied rather suddenly. The lateness of the hour is due, therefore, not to the dance, but to the waiting in a long line for a horseless carriage of unconscionable size. The modern world has clearly done nothing for transport. P.S. Managed to avoid the hoyden Emily Thompkinson, who has purloined my creation and added things of her own. Nefarious Creature! Before I came, I went to visit Jane Austen's grave in Winchester Cathedral to pay my respects, you know, and tell her about the grosses. [Laughter] I don't know how she would react to an evening like this, but I do hope -- I do hope she knows how big she is in Uruguay. This page was last edited on 8 November 2018, at 00:02.